Proper dance attire is required for all dance classes. Properly fitted dance shoes and comfortable, correctly fitted attire are important elements in assuring a dancer's success. Having 'special' clothes and shoes that are just for dance class helps young children recognize that dance time is a special and important event. All dancewear should be purchased at Attitudes Dance and Activewear, located in the Holland Town Center, the same complex as Avalon School of the Arts. Attitudes is in the same building as Carter's, on the opposite side. It is next to the restrooms, behind EcoBuns. Attitudes carries all items that you need for dance class and can fit you properly for dance shoes, AND they will fit you with 'growing room.' 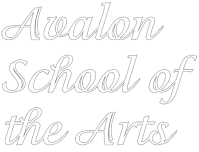 Be sure to tell them that you are taking classes at Avalon you will always get 15% off your dance shoes. We do not allow ballet shoes from Payless, Target, or other 'big box stores'. They are too stiff, do not properly show the shape of the foot, do not promote the proper development of the muscles in the foot, and don't allow students to point their toes or bend their feet. For children under the age of 8, with your 15% discount and including tax, your Bloch Bunnyhops from Attitudes will cost LESS than you will spend on lesser quality shoes from Payless or Target. Boys in all genres of dance should wear comfortable clothing such as a t-shirt and shorts or sweats. No excessively baggy clothing is allowed. In tumbling classes, t-shirts should be tucked in. Boys in ballet should wear shorts or jazz pants that are tighter fitting and a t-shirt that is tucked in. No shorts or pants with zippers or buckles are allowed. For tap classes, black lace up oxford tap shoes are required, black ballet shoes for ballet classes. Dance for 2-Year-Olds (age 2-3) - Any color leotard, footed tights, ballet skirt is optional. No large tutus (as it makes it difficult for little ones to see their own feet). Pink Bloch Bunnyhop ballet shoes. NO dress up clothes, long skirts or street clothes. Hair pulled back. Ballet/Acrobatics Combination (age 3-4 & age 4-6) – Any color leotard, footless or convertible tights (so children can go barefoot for tumbling). Ballet skirt is optional. Pink Bloch Bunnyhop ballet shoes. NO dress up clothes, long skirts or street clothes. Hair pulled back. A low ponytail, braid or two pigtails are good for the tumbling portion of class. Ballet/Tap Combination (age 3-4 & age 4-6) – Any color leotard, tights, optional skirt. Pink Bloch Bunnyhop ballet shoes and black Capezio tyette tap shoes. Hair pulled back. Jazz/Tap Combination (age 5-7) – Any color leotard; tights, jazz pants, shorts or tights. Black Capezio tyette tap shoes. Tan jazz shoes or ballet shoes for the Jazz portion of class. No bare feet. Hair pulled back. Any color leotard, tights, pink leather or canvas ballet shoes. Skirt or dance shorts are optional. Any layers that are worn must be tight fitting. Hair in a ponytail or bun. Any color leotard or close fitting tshirt; leggings, yoga or jazz pants - NO jeans or street clothes. Black Capezio or Bloch tap shoes. Hair pulled back. Comfortable clothing, that students are able to move freely in, NO tight jeans allowed. NO open-toed shoes, check with instructor before purchasing dance shoes. No 'outside' shoes allowed. Hair pulled back. Any comfortable clothing, loose fitting clothing with leggings, shorts, or sweat pants. Tshirts must be long enough to cover belly when arms are raised. A clean pair of tennis shoes are essential - shoes that have been worn outside are not allowed. Hair pulled back.